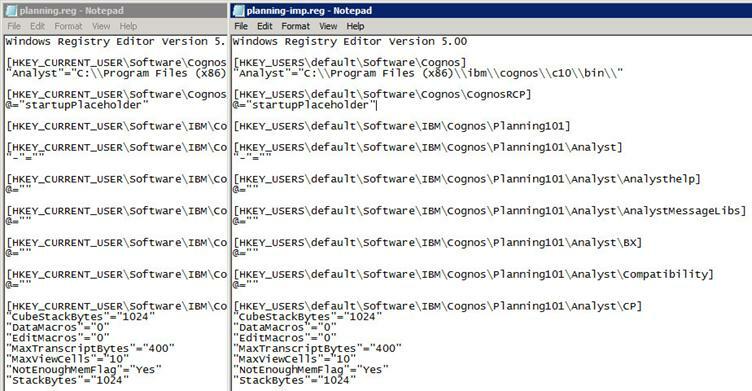 A known issue has arisen in the latest versions of IBM Cognos Planning when installing on 64bit servers as detailed here: https://www-304.ibm.com/support/docview.wss?uid=swg21472649. On developing a new production environment in our own infrastructure I was hit by the issue myself, but rather than scrap the 64bit VM I had configured and build a 32bit server in its place, I decided to take things into my own hands and formulated a bespoke fix. Initially the thought was to (either through local or group policy) create a logon script for new users, in order to amend the registry accordingly so that these applications would work. However, thanks to the above article detailing the method of loading the ‘default user’ profile as a ‘hive’ in the registry (by opening the NTUSER.DAT in the default user profile folder), I realised that a script/policy amendment shouldn’t be necessary. Instead, all I should have to do, in theory, is amend the registry keys in the default user’s NTUSER.DAT file (or hive) so that these will automatically appear in the HKEY_CURRENT_USER registry tree for new users. 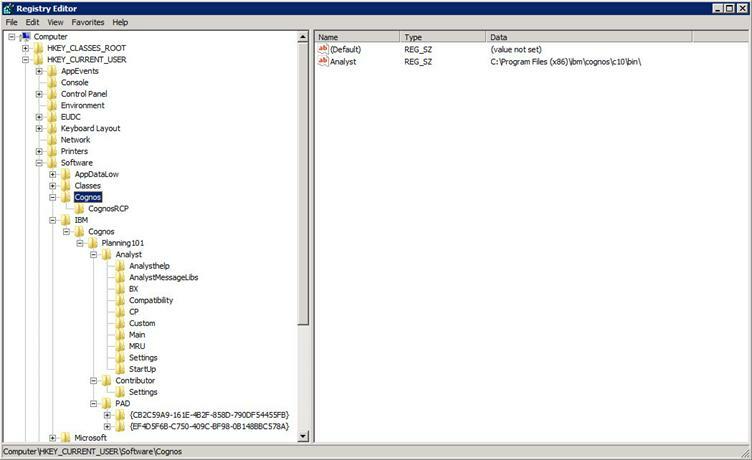 First task: export the appropriate keys from the user’s profile under which the environment install had taken place. The Cognos key can be added manually as there are hardly any sub-keys / values involved, but the IBM key (at least) should be exported to a .reg file. In this example I have added the Cognos key export to the .reg files manually (the first two lines), so that both keys will be imported from one file. This is the only bit of grunt work in the process and it doesn’t take long to change the paths accordingly as there aren’t many sub-keys in the IBM tree. Once this is completed, simply import the amended .reg file (planning-imp.reg in my case) and you should see the Cognos and IBM keys under HKEY_USERSdefaultSoftware. Then, with ‘default‘ selected, go to File -> Unload Hive… and answer ‘Yes‘ to the prompt. Job done! All users will now be able to use Analyst and Planning Manager on the server (unless they have already logged on and had their Windows profile created of course!). So just make sure these steps are taken as a matter of course while installing Cognos Planning 10.1 on a 64bit server (before it goes live) and you shouldn’t have any problems.